A high school-aged Sherlock Holmes unravels the mystery of a rash of apparent suicides that he believes are actually murders. "Young Sherlock Holmes" is directed by Barry Levinson, who has helmed numerous films like "Diner," "The Natural," and the Oscar-winning film "Rain Man." It is written by Chris Columbus, who has penned the screenplays for some of our most beloved childhood films like "Goonies" and "Gremlins." It stars Nicholas Rowe as the titular teenage Sherlock Holmes, and Alan Cox as a young John Watson, who narrates the story. The film opens with a mysterious hooded person shooting a random passerby with a thorn from a blowgun. A short time later, the man begins to wildly hallucinate before jumping out of a window. The police write it off as suicide, but similar incidents continue to happen. When Sherlock's mentor Rupert T. Waxflatter, played by Nigel Stock, is targeted next, Sherlock decides to look into the case and quickly discovers these incidents likely involve foul play...but by whom and why?? Holmes begins his investigation with the help of Watson and Waxflatter's niece Elizabeth, played by Sophie Ward. There are a lot of 80's films that have become deeply embedded in popular culture. 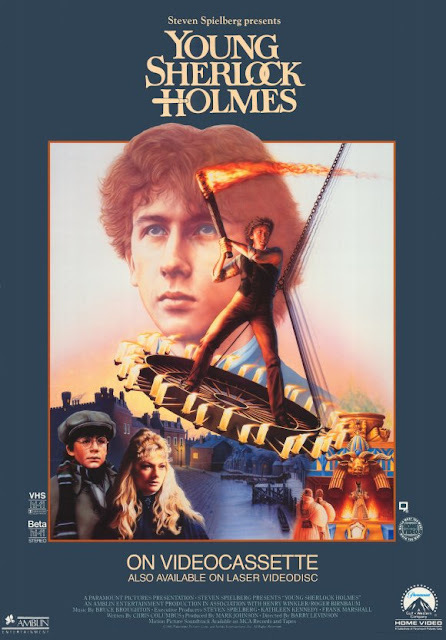 We feel that "Young Sherlock Holmes" really had the potential to be a movie like this, but it often gets unfairly overlooked. It is a fun and engaging adventure film with rather stunning and groundbreaking special effects for 1985. The visuals of each person's hallucinations, which drive them to suicide, are done amazingly well as food and statues come to life to torment those who have been affected by the poison. This flick also marks the first time that an entirely CGI character was used in live action cinema. The computer-generated stained glass knight took Industrial Light & Magic a whopping four months to create and was only on screen for about a minute. These effects earned "Young Sherlock Holmes" an Oscar nomination, though it lost out to Ron Howard's "Cocoon," perhaps rightfully so. We believe Nicholas Rowe has just the right presence to play Holmes. He's got the right bit of arrogance and enough endearing charm to bring the character to life with great success. We also like Alex Cox and Sophie Ward as Watson and Elizabeth, though they are mostly outshined by Rowe. Some movies that we watched and loved as kids don't age well, but upon revisiting "Young Sherlock Holmes," we feel it has really stood the test of time. Sure, it isn't a perfect film and the story is rather simple, but it is still a really good time that keeps us enthralled and interested from beginning to end. Do we recommend the film: Yes!